In a recent blog post Dr. Roy Spencer took the skeptical community to task for a list of arguments he considers to lack merit. 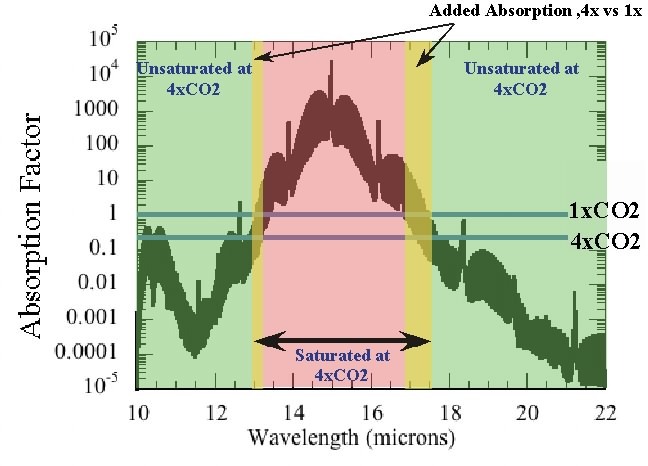 One of these was the argument that the CO2 absorption bands are saturated. He stated that the saturation was obviated by “pressure broadening” and listed a reference he felt would explain this. Pressure broadening was defined before the 1940’s and much work was done on it in the 1950’s and 60’s. The math is a Lorenzian hairball, but it basically describes interference between colliding molecules on the width of spectral lines of absorption and emission. Typical values for earth conditions are one to ten percent, and the effect pertains not only to “self” broadening by an individual gas, but to all the various gasses and molecules in the atmosphere according to their individual properties. As such, pressure broadening is just an aspect of the interference that causes saturation in the first place and is not a good way to describe what remains of the CO2 spectrum after saturation. Suppose you had one painter painting a room and you were in a hurry so you keep adding painters. At some point adding more painters does not increase the painting speed because they just get in each other’s way. This is Saturation. If you put way too many painters inside they might bulge the walls out a bit. This is pressure broadening. Let’s just say the room is the 15 micron absorption band. What we are really painting is a strip motel with rooms on either side of room 15. Our ethereal painters are painting all the rooms. Only rooms 14-17 are saturated. Adding more painters to the project will still speed up the painting of rooms 13 and 18, but we can only add painters evenly to all the rooms. The incremental efficiency of adding painters is dramatically reduced by the saturation of rooms 14-17. The vertical lines at wavenumbers 570 and 600 are room 13. The lines at 730 and 770 are room 18. Rooms 14 to 17 between are saturated. That’s the entire motel. There are a couple of ways we can evaluate the efficiency of our painters. One way is the energy of the photons. This energy is given by Planks’ constant multiplied by the speed of light divided by the wavelength. I have totaled these energies and room 13 gets 1.18E-24, rooms 14-17 get 3.78 and room 18 gets 1.04, all E-24. The total is exactly 6. By this measure 63 percent of the efforts of additional painters will be lost as a result of saturation. Another approach is to multiply the flux or intensity by the wavelength to derive the watts/m2. 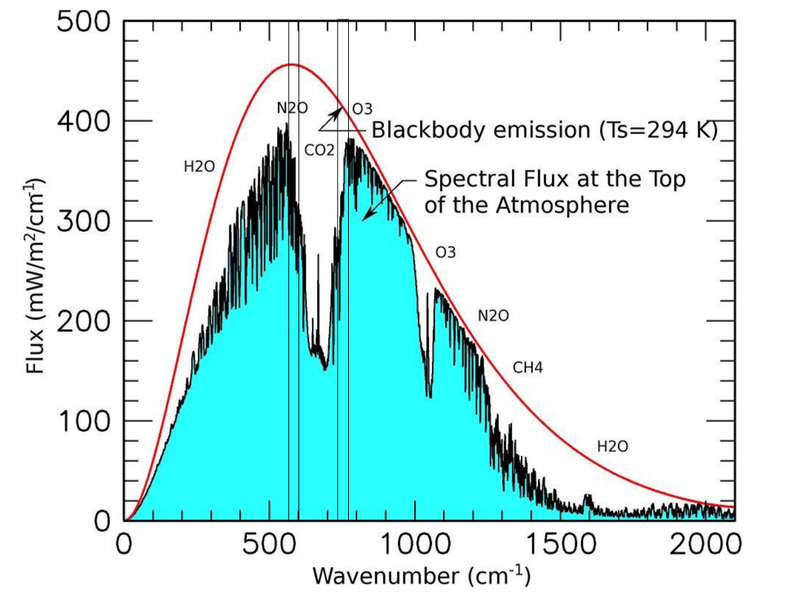 One could subtract the observed value from the blackbody value but this is confused by overlapping influences of water and N2O. The human influence on climate is arguably the most important issue of our age. Our models aren’t working. The models have included an approximately logarithmic diminution of effect for incremental CO2, but if 63 percent of the effect of CO2 is already lost due to saturation, this could be an important reason for their failings. This entry was posted in Climate, climate sensitivity, Optical Material Properties, Photon, Pressure Broadening, Spectra and tagged Carbon dioxide, Pressure Broadening, saturation. Bookmark the permalink.